If you enjoy the majestic mystery of heading off into the wilderness not entirely sure of where you are going, then do not read on. 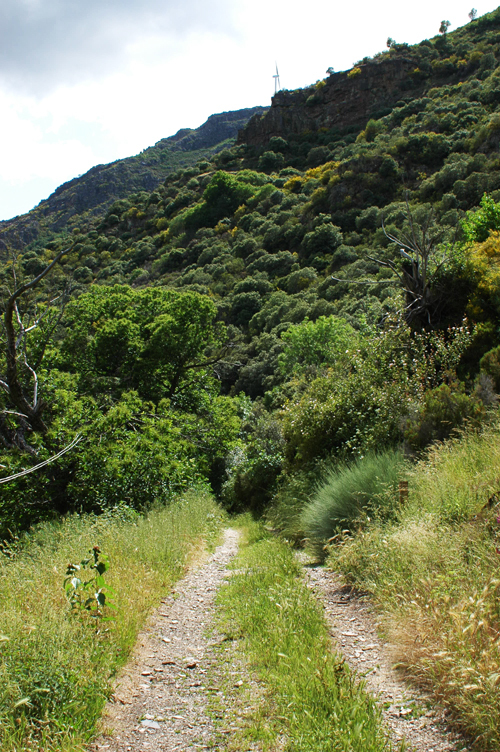 Simply head to San Facundo and walk into the mountains. If, however, you like a little more substance to your itinerary then here are a few details fleshed out about how to get to Matavenero. Do be aware, however, that although I got close I did not ultimately make it to the village, but I got to within a few kms. They ask that you contact them at least two weeks before arriving. You can write to: Consejo, Matavenero, Lista de Correos, 24300, Bembibre, León, Spain. Or call on (+34) 987 693 216 between 19.30 and 20.20 in evenings. Bembibre is a small town near Ponferrada in León province, in the region of Castilla y León, north west Spain. The easiest way to get there is by bus. There are several daily buses on a very good network. The best way to check out what buses there are and to book them is via the Movelia website. Through this you select your bus and even your seat number. Simply print off the receipt and this counts as your ticket. You just show it to the bus driver on boarding. If coming from Madrid it is about 5 hours on the ALSA buses – very comfortable coaches which stop for a toilet and food break after a few hours. It costs 25 euros one-way.You need to get this from the Méndez Alvaro (Estación del Sur) bus station in the south of Madrid. It is not a direct metro ride and a taxi costs about 14 euros from central Madrid. The bus departures are only advertised by their final destination, in all probability this will be Santiago de Compostela. Once the platform number is advertised on the display boards you can check on the list at the front of the bus that Ponferrada is listed as a destination. That means it is going past Bembibre too. San Facundo is a small village to the south east of Bembibre. It consists of a few houses, a bar and a public telephone. You need to get a taxi. When you get off the bus at Bembibre walk east (ahead as you get off) for two blocks. You will then see a taxi rank on your left. The telephone number for the local taxi is (+34) 987 510 580. Alternatively you can call Cesar direct on (+34) 629 449 580. Ask to be dropped off in the village. 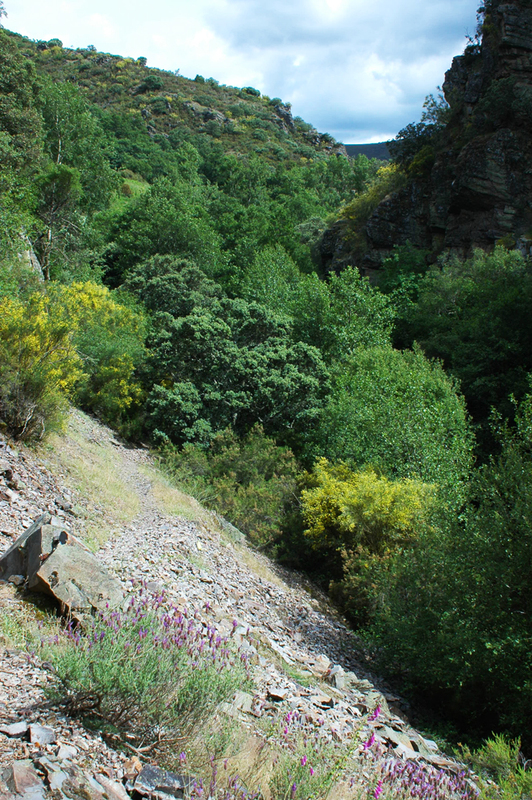 From San Facundo it is about a 4 km walk into the mountains along the Rial river (or arroya del Rial, stream of the Rial). Maps of the area are hard to find. 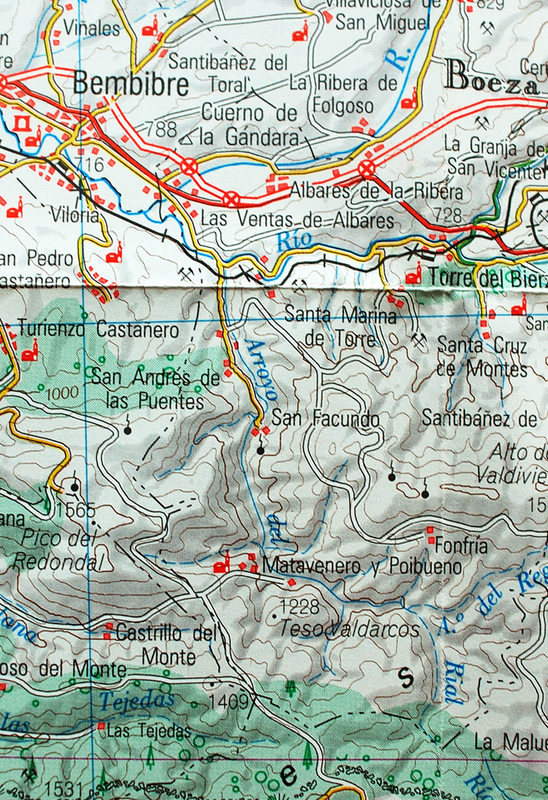 A reasonable one is the Mapa Provincial León, 1:200,000 published by the Centro Nacional de Informacion Geografico (www.cnig.es), but it is still a large scale to walk with. 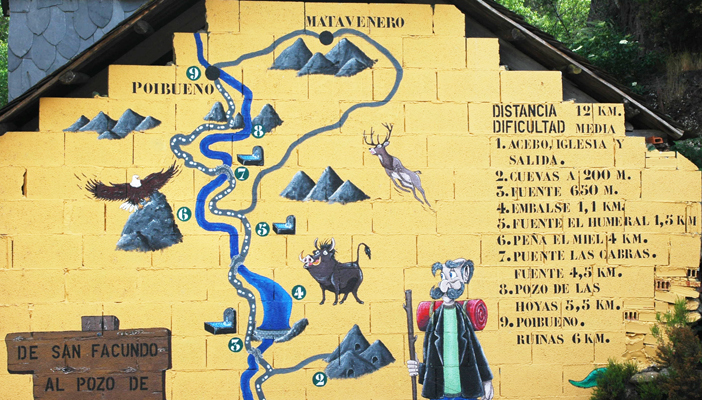 In San Facundo there is a route to the village painted on a wall opposite the bar and pictured here. You need to head south out of the village past a children’s play area on your left until a large grassy track takes you into the woods. At the end of this track there is a concrete footbridge on your left. Take the bridge and then almost immediately the track goes to the right and a steep rocky path is straight-ahead and up. Take the path up. At various points on this path there are signs that say Matavenero, or rainbow paintings to indicate you are going the right way. You need to head south as your general direction. 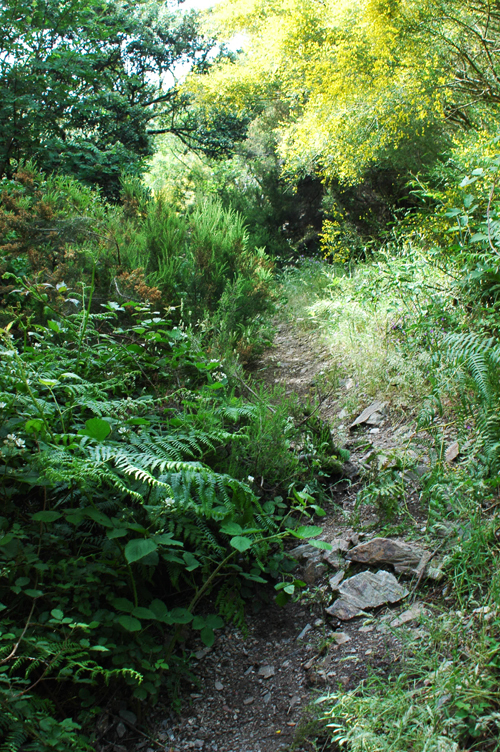 Be warned, it is a rough, narrow, steep and overgrown path. You need robust footwear and to be able to cope with wet rocks, scree and snakes. There are some lovely views of wild mountain flowers, the river and steep mountain sides. But it is also a tough, vertigo-inducing path. You follow this path for 4 kms and over two bridges crossing the river. With a backpack it should take about two hours to walk – so make sure you have given yourself enough daylight to get to the village. If the walk from San Facundo is not possible then you can drive to the ‘car park’ of the village and walk the short 1 km down to it. Sometimes this driving route in is closed because of snow or rain damage. 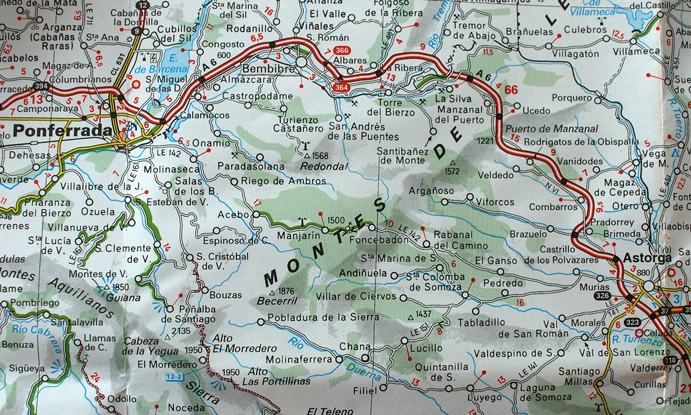 If you are thinking of hiring a car León is about 70 km to the east and has a couple of car hire companies next to its train station. If taking this route you approach the village from the west. We you can see on the map below the way the village advise is to drive to Foncebadón which is on the well sign-posted ‘Camino de Santiago’ (a long distance popular pilgrimage walk) route. This is either west out of Astorga or east out of Ponferrada. just west of Foncebadón take the untarmced track north through the pine trees, when the track forks take a right, and at the crossroads take another right and after about 1.5 kms you reach the village car park. Then walk north east down into the village. Very handy, much appreciated. Please note that I heard some here don’t want to be contacted…. Thank you for this. I am afraid I do not know if there is a mobile phone signal, but I doubt it.